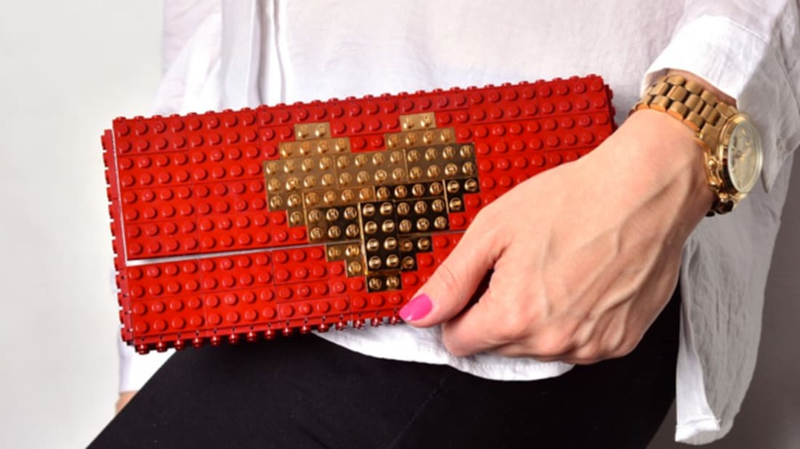 Inventive accessory store Agabag is known for their bags, pins, and other fashion objects made with real LEGO bricks. Their ultra-trendy collection already looks pretty sleek, but their latest series plates the bricks in real gold, bringing the accessories to a whole new level. As Design Milk reports, the process of glitz-ing up the already pretty luxurious bags turned out to be a tricky process. Covering real LEGO bricks in gold is a little more complicated than just pouring it on. LEGO bricks need to be a very specific size and shape to properly connect together, and a layer of gold can get in the way of the bag closing properly. Agabag found the perfect balance with a layer of 24k gold that's thin enough not to interfere with the bag closing, but thick enough to not wear off with use. The complex procedure required work at three different facilities. The bags are all lined with satin, and are flexible despite their LEGO exterior. Besides clutches and purses, the company also makes earrings, cufflinks, and bracelets. Check out their Etsy page for more fancy and nostalgic accessories.